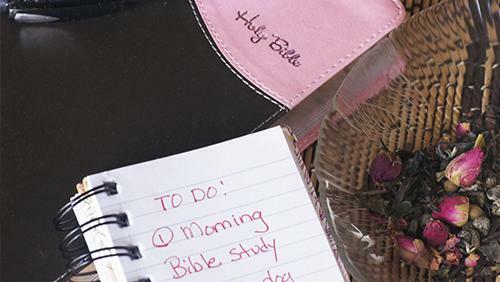 Is your spiritual life on your to-do list? We make checklists for our workdays. We create to-do lists for home projects. We plan out the dinners we’ll cook for the upcoming week. We schedule our workouts into our morning or evening. So why don’t we plan out our spiritual life with a similar amount of thought or in a concrete way? Why don’t we come at our faith with the same intention and focus and purpose? French writer and poet Antoine de Saint-Exupéry said, “A goal without a plan is just a wish.” So maybe it’s time we move our faith-related wishes into action by actually creating a plan. My husband and I have been wrestling with this thought lately. We realized that we personally tend to adopt a mind-set that the kind of faith life we desire will just happen. It feels unnatural to write down prayer lists, schedule out Bible readings, or strategize conversations with our unchurched neighbor, etc. I was meeting with one of my pastors for coffee last week, and he used one of my favorite words over and over again: intentional. We hear this word used often—it’s kind of a societal buzzword. With all the busyness and distraction of our lives, there’s a call to approach life with intention. But intentional is not often a word we associate with our spiritual lives. I don’t care if it’s weird—I’ve started planning out my spiritual life just like I plan out everything else. I have a daily log I use to help me stay focused on each day’s tasks and priorities, and one of the check boxes I check off each day is “Pray for Kyle.” (My husband.) Further on in the day, scheduled during my lunchtime, my daily log has a check box, “Pray for people on my prayer list.” When I pray, I consult the actual prayer list I have written down so I don’t forget who to pray for. As far as my Bible reading, I have a friend who’s my accountability partner, and we check in with each other every week to make sure we’re keeping up with our plan. And now, at my pastor’s suggestion, I’m working on coming up with a list of a few people in my life who I want to very intentionally “work on” in sharing my faith. I think and hope that if I keep this up, these things will become a habit, that I will remember on my own to pray often and read my Bible, etc. Until then, I’m not ashamed to admit that those spiritual activities are a work in progress and something I care enough about to include on my to-do list. They’re not on there so I can simply get them done and cross them off; they’re there right next to everything else going on in my life because they deserve just as much attention—well, more attention, really—as all the other things I plan into my days. Diana Kerr is a blogger, writer, and speaker. She is also a planner, a list maker, and a goal setter, except on Sundays when she very intentionally puts that personality to rest. In her dream world, she would teach people the art of creating plans and lists and goals, and then she would enjoy watching the dramatic changes in their lives as they lived with intention and purpose.